Worried about your recession? Get sophisticated hair loss treatment at Meshkati Hair Centre. “YOU DON’T KNOW what you’ve got till it’s gone” can be applied to many things: President Obama, summer heatwaves, and membership of the European Union to name but three. On a more personal level, this sentiment might be best applied to hair. One morning you’re painstakingly sculpting your luscious rug into a magnificent quiff, as though The Great Wave off Kanagawa were cresting upon your forehead, and then time wooshes forward and you find yourself glumly combing a few sad scraggles across a gleaming dome of scalp. Happily, you inhabit the year 2018, and solutions are at hand – none more advanced than Meshkati Hair Centre in Belgravia. 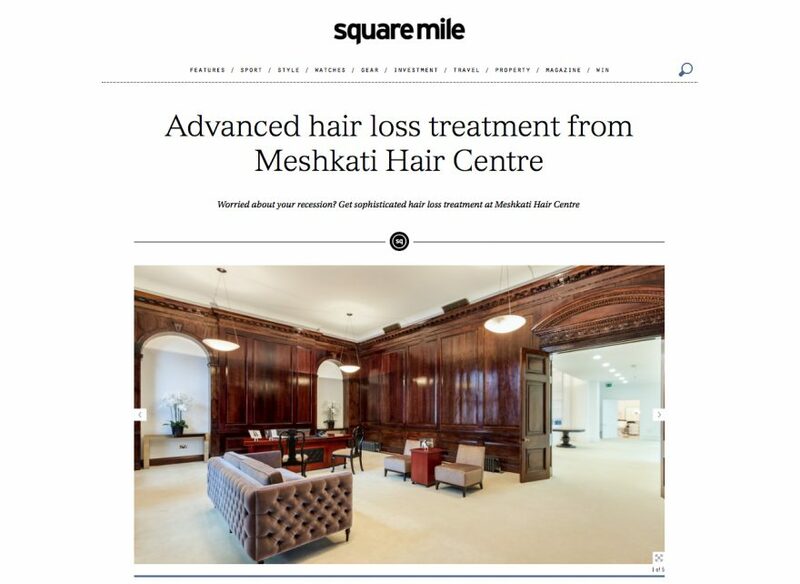 Meshkati offers personalised solutions to restore both density and volume of hair, regardless of the extent of hair loss. MESHKATI IS COMMITTED TO RESEARCHING AND CREATING EVER-MORE EXTENSIVE TREATMENT AND EVEN HAS ITS OWN LABORATORY. Non-surgical procedures use natural techniques that allow for a complete or partial hair reconstitution with immediate and lasting results. Using a detailed hair analysis called DNA-matched, Meshkati experts select substitution hair that matches the original in texture, color, degree of waviness and thickness. Surgical options include Follicular Unit Extraction and Permanent Bridgepoint, two procedures carried out under local anaesthesia that provide optimal results. The former corrects limited sparse areas on the scalp, while the latter adds unlimited hair with results immediately visible at the end of the intervention. With more than 30 years in the industry, Amy Meshkati is something of a pioneer in the field of hairloss, and launched Meshkati in 2016 with the aim of becoming the leading hair restoration centre globally. It’s certainly well on the way: Meshkati is committed to researching and creating ever-more extensive treatment, and even has its own laboratory – with specially created equipment and machinery – to achieve this goal. Click here to view the article online.